The base-building combat game will allow players to join forces with Optimus Prime and the Autobots or with Megatron and the Decepticons in the battle for Earth. Hasbro, Backflip Studios and Space Ape Games have announced Transformers: Earth Wars for iOS and Android. The base-building combat game will allow players to join forces with Optimus Prime and the Autobots or with Megatron and the Decepticons in the battle for Earth. In Transformers: Earth Wars, players will build a base and defend it with things like missile launchers, shock towers and laser turrets. The game will allow players to form a team of Transformers, and will include characters like Optimus Prime, Megatron, Bumblebee and Starscream. During battles, players will be in control of their characters’ transformations. The story in Transformers: Earth Wars will be based on the Generations Prime Wars trilogy, with dialogue written by Simon Furman and voice acting from Peter Cullen and Frank Welker, the original voice actors for Optimus Prime and Megatron, respectively. 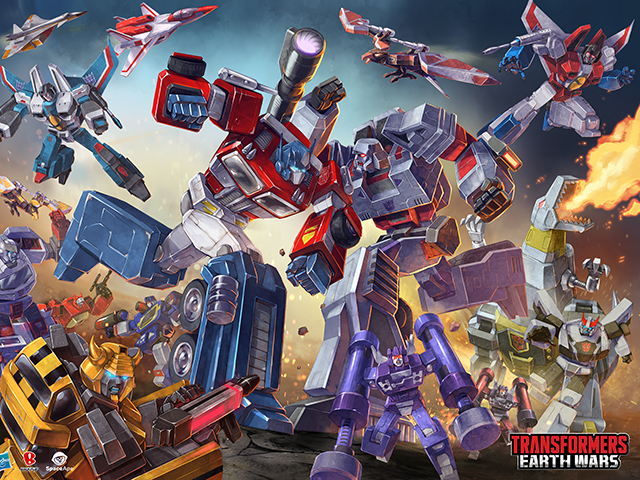 We are excited to join forces with Backflip Studios and Space Ape to bring our iconic Transformers brand to life in a new way through the launch of Transformers: Earth Wars. Transformers fans and fans of combat strategy games will love the explosive action as they join the fight to control the fate of Earth. Transformers: Earth Wars is expected to launch on iOS and Android worldwide (excluding Japan and China) in Spring 2016. The game will be free to download, and will include in-app purchases. Interested players can pre-register for the game here.